Zasman Vet run the Pet Passport scheme in conjunction with the rules and regulations supplied by DEFRA (Department for Environmental Food and Rural Affairs) for the transport of your pets to other European and International countries. When travelling with your pet dog, cat or ferret, the rules you must follow depend on the country you’re going to or coming from. For further information on travelling with your pet please visit the DEFRA website by clicking here. You don’t need to meet the pet travel rules if you travel within the UK or between the UK and the Channel Islands/Isle of Man. Your pet must be microchipped. This must be done before your pet gets a Rabies vaccination. Your pet must have been vaccinated against Rabies. You must wait 21 days from the date of the vaccination before travelling. The day of vaccination counts as day 0 and not day 1. 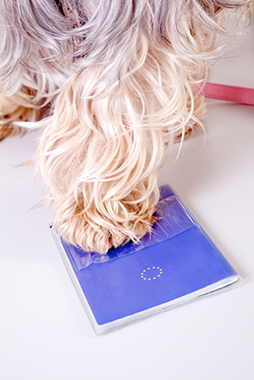 Your pet must have a pet passport or third-country official veterinary certificate. Whilst travelling abroad your pet may be exposed to many diseases which we do not have in the UK. You may be required to take some additional precautions to prevent your pet from contracting these. We will be happy to discuss your specific travel plans with you and how best to protect your pet. Make an appointment to see a vet in the country you are travelling from to have your pet treated against tapeworms. This treatment must be administered no less than 24 hours and no more than 120 hours (5 days) before entry into the UK. To maintain your passport for future travel, your pet’s Rabies vaccine simply needs to be kept up to date and your pet may accompany you on as many journeys as you would like. It is important not to let your Rabies vaccine lapse so that the process does not have to be repeated. If you need more information on PETS please visit the DEFRA website by clicking here.